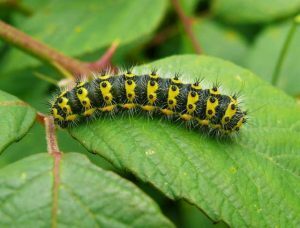 Emperor Moth caterpillar, Gramborough Hill, Salthouse, 23rd June 2007 (John Furse). The next time when you see a live caterpillar, observe how fast and how continuously it devours fresh leaves much larger than its size. 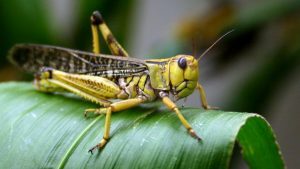 Also, the next time when you see a flying locust, observe how much destruction it causes to green crops far heavier than its weight. We human beings are also like the caterpillar and locust when it comes to consuming food. The only difference is we don’t notice it. Our day starts with breakfast and is filled up with coffee breaks, drinks, lunch, high tea, dinner, savouries, and after dinner snacks. Add to this official receptions, birthdays and religious events. In fact, we are happy to eat even the caterpillar and locust if we are hungry and can’t find anything else to eat. We need a hand trolley to buy our weekly groceries in a supermarket because we can’t pick the enormous weight of our personal shopping. Our waist lines and waste bins are getting bigger and tubular because the amount of food we consume and waste is incredible. A total failure of having control over our devouring appetites is manifest in buffet service restaurants where as much food is wasted as is eaten by customers. We are spendthrift, greedy and environment unfriendly. Only if we knew that we will have to account for every grain of cereal or drop of water we consume or waste we would be more caring and thoughtful. It is down to knowing all about Rizq, and how we can appreciate and use it properly. The global food and beverage sector comprises between 17 to 20 percent of total global economy. In monetary terms it is in excess of US $ 15 trillion annually. Food losses and waste amount to roughly US $ 680 billion in industrialised countries and US $ 310 billion in developing countries. In the UK alone the wasted food amounts to US $ 17 billion. Rizq is a term familiar to Muslims. It has a wide and deep theological basis in Islam. It means provision of all the resources necessary for human sustenance. Rizq plays a central role in the creation of jobs, making of economic policy, collection of taxes and fulfilment of socio economic rights of citizens. The State assumes responsibility for the provision of clean water, food, healthcare and shelter for its citizens. The rich pay zakat and taxes from their wealth which are used to finance public services and provide subsidies for health, education, housing and food for the poor. There is no conflict between the theological and secular view of what constitutes socio economic necessities of society and how these are met in a working economy. The theological view of Rizq focuses on the ownership of provisions which rest with Allah and which are managed by human beings to meet contingencies. The secular view of Rizq is concerned more with the production, distribution and efficient management of resources owned by the State, the private sector and individuals. Islam requires its followers to procure the necessities of life comprising food, clothing, shelter and associated goods and services through permissible means. These should be obtained from clean and lawful sources. “O mankind, eat from whatever is on earth that is lawful and good and do not follow the footsteps of Shaitan. Indeed, he is your clear enemy.” [Surah Al Baqarah 2:168]. In Islam Allah is the owner and provider of Rizq to every living creature, be these plants, insects, birds, animals, human beings or jinns. Allah causes rain to fall from the heavens and He brings life to earth from water. Allah provides for everyone in the food chain of life. Allah has the power to increase or decrease Rizq. “And in the succession of night and day, and in the means of subsistence which Allah sends down from the skies, giving life thereby to earth after it had been lifeless, and in the change of the winds: in all this there are signs for people who use their reason.” [Surah Al Jathia 45:5]. “Allah holds the keys of the heavens and the earth: He grants abundant sustenance or gives it in scant measure to whoever He wills: for, behold, He has full knowledge of everything.” [Surah Al Shura 42:12]. “And there is no creature on earth but that upon Allah is its provision, and He knows its place of dwelling and place of storage. All is inscribed in a clear book.” [Surah Hud 11:6]. “And how many a living creature is there that takes no thought of its own sustenance; Allah provides for it as (He provides) for you – since He alone is all-hearing and all-knowing.” [Surah Al Ankabut 29:60]. In ancient times idol worshippers used to make offerings of gold, money or food at the altars to please deities with a view to seeking their intervention for solving their daily problems. Allah strictly forbids idol worship. “And bid your people to pray and persevere therein. But remember We do not ask you to provide us sustenance; (rather) it is We who provide sustenance for you…” [Surah Ta’Ha 20:132]. “You worship only (lifeless) idols instead of Allah…they do not have the power to provide sustenance for you: seek, then, your sustenance from Allah and worship Him alone and be grateful to Him…” [Surah Al Ankabut 29:17]. Islam makes it clear that blood sacrifice of cattle offered by His servants to seek the pleasure of Allah does not reach Him; “it is only their God-consciousness that reaches Him.” [Surah Al Hajj 22:37]. “I do not want from them any provision, nor do I want them to feed Me. Indeed, it is Allah who is the provider, the firm possessor of strength.” [Al Zariyat 51:57-58]. Rizq is generally understood as food and wealth. However, in a broader sense Rizq comprises everything whether material, social or spiritual that is required to live comfortably in the world. Man is a social being and desires to collect wealth, buy property, have a family, keep company of friends, wield power, exercise influence and enjoy fame and good public reputation. All these are allowed if a person lives within his means and has earned these through his hard work and Allah’s blessings. But most of us cross the red line in acquiring these treasures without thinking that at the end of the appointed time we have to go to our graves empty handed and account for our deeds when we were in power, how we spent our wealth or what we did when we enjoyed fame. A righteous spouse and children are part of one’s Rizq. If they are on the right path together it becomes harder for Shaitan to misguide the family and take them astray from the right path. There is an interesting similarity between Christianity and Islam on the concept of Rizq in the hereafter. In the Lord’s Prayer there is the famous supplication ‘Give us our Daily Bread”. In Surah Al-Fatiha Muslims ask Allah “Guide us on the Right Path”. Both supplications refer to Rizq in the afterlife. The Daily Bread in the Lord’s Prayer is the bread of Tomorrow or afterlife; The right path in Surah Al Fatiha is the path that leads to the Gardens of Paradise where there will be abundant Rizq for the faithful servants of Allah. The first and foremost requirement for Rizq is that it should be halal. The next is that it should also be taiyyeb. Halal refers to the legal way Rizq is earned. Taiyyeb refers to the purity of food or money that one receives as a part of his earnings. For example, two Muslims work the same number of hours and with the same level of responsibility in two different enterprises. One enterprise makes shoes and the other enterprise runs a betting shop. The salary of both Muslims is halal because it is payment for their labour as defined by their legal work contracts. But the salary of the Muslim brother who works in the enterprise which runs a betting shop is not taiyyeb because gambling is forbidden in Islam. There are two fundamental means through which Rizq is obtained. These are land and money. Land is a source of agricultural produce, minerals, precious metals, cattle ranching, poultry farming, fisheries and ground rents. Money on the other hand buys services and is the means through which trade takes place. There is no restriction on Muslims to live in a particular land or place to earn Rizq. “Allah has made the earth easy to live upon: go about then in all its regions and partake the sustenance which He provides: but (always bear in mind that) unto Him you shall be resurrected. [Surah Al Mulk 67:15]. Like fate, the Rizq of every person is exclusive to him. It is said that on every grain of cereal the name of who will eat it is written. A person’s Rizq may take him thousands of miles away from his home for livelihood. Sometimes you end up eating at a place you never imagined you will go there. Sometimes you do not expect a fortune and yet it comes from nowhere in the form of a prize, a good wife, a highly paid job or an unexpected inheritance. Allah provides for him in a manner beyond all expectation …” [Surah Al Talaq 65:3). A person’s Rizq can change with Allah’s Will or with sincere Dua or good behaviour. Compare the Dua of Jonah in the belly of the fish where he could have been destined forever but due to his Dua of repentance Allah returned him to land until his appointed hour [Surah Al-Ambia 21:87]. “Allah extends provision for whom He Wills and restricts it…” [Surah Raad 13:26]. “Indeed, Allah provides for whom He Wills without account.” [Surah Al-Imran 3:37]. Allah has bestowed some people with more Rizq than others. “And on some of you Allah has bestowed more abundant means of sustenance than on others: and yet, they who are more abundantly favoured are often unwilling to share their sustenance with those whom their right hands possess, so that they all might be equal in this respect. Will they then deny Allah’s blessings? [Surah Al Nahl16:71]. “Behold, your Creator grants abundant sustenance, or gives it in scant measure, unto whomever He wills: verily, He is fully aware of the needs of His creatures, and He sees them all.” [Surah Al Isra 17:30]. “Allah may reward those who believe and do righteous deeds: for it is they for whom await forgiveness from sins and a most excellent sustenance”. [Surah Saba 34:4]. “But if any of you devoutly obeys Allah and His Messenger and does good deeds, on her shall We bestow her reward twice-over: for We shall have readied for her a most excellent sustenance in the life to come. [Surah Al Ahzab 33:31]. “Behold, my Sustainer grants abundant sustenance, or gives it in scant measure, unto whomever He Wills among His servants; and whatever it be that you spend on others, He always replaces it: for He is the best of providers.” [Surah Saba 34:39]. “And remember when your Lord proclaimed, if you are grateful I will surely increase you in Rizq; but if you deny it, indeed My punishment is severe.” [Surah Ibrahim: 7]. “Ask forgiveness of your Lord. Indeed, He is ever a perpetual forgiver. He will send (rain from) the sky upon you in (continuing) showers. And give you increase in wealth and children and provide for you gardens and rivers. [Surah Nuh 10-12]. If a believer leaves his place of birth due to persecution and migrates to other lands to follow his faith and seek the pleasure of Allah, his Rizq will increase due to his sacrifice and hard work. This also applies to those who give shelter to asylum seekers and help them settle down in their new lands. “And they who have attained to faith, and who have been forced out of their homes and are striving hard in Allah’s cause, as well as those who shelter and succour (them), it is they who are truly believers! Forgiveness of sins awaits them, and a most excellent sustenance.” [Surah Al-Anfal 8:74]. Beware, abundant Rizq can lead to disobedience. Abundance of Rizq or wealth leads to false pride and can make one forgetful of Allah’s blessings. “For, if Allah were to grant (in this world) abundant sustenance to (all of) His servants, they would behave on earth with wanton insolence: but as it is, He bestows (His grace) from on high in due measure as He wills: for verily He is fully aware of (the needs of) His creation, and He sees them all.” [Surah Al Shura 42:27]. There is right of others in your Rizq. If you examine your life from childhood to the present, you will note that the Rizq you earn is not really yours alone and neither can you guarantee that it will always keep increasing or that it will remain constant. In your Rizq is a share of your family, especially those who have a right in your inheritance, the poor, the begging and those who do not ask but you can tell that they are destitute. “And in their possession there is a share for those who might ask (for help) and those who are deprived.” [Surah Al-Zariyat 51:19]. The concept of Zakat and Inheritance in Islam illustrates how certain eligible persons have a legal right in your Rizq. Zakat refers to the right of the poor in your wealth during your lifetime. Inheritance relates to the right of relatives in your wealth after your pass away. Zakat is calculated in terms of agricultural produce and is paid in the form of money. Inheritance is on the entire estate of the deceased. Successful people, as defined by Allah include those who believe in the unseen, establish prayer and spend out of what (Allah) has provided for them. [Surah Al Baqarah 2:3]. It is common observation that those who are richly endowed with material means possess a miserly attitude toward the poor. They not only despise them but are also unwilling to sympathise with them or offer any material help to lift them out of poverty. Of course there are charity balls and fundraising events to raise funds for an emergency or disaster but this is, most of the time, either too little or too late. Compared to the rich, the poor are naturally endowed with large heartedness and generosity even though their means are limited. This is a test from Allah. When He decides to give someone more than his needs it is a sign that that person is holding someone else’s Rizq as trust in his hands and that he must pass it on. If he doesn’t do so, he will be answerable to Allah on the Day of Judgement. “Woe is to the person who collects wealth and continuously counts it and thinks that his wealth will make him immortal. No, he will surely be thrown into the fire that Allah has fuelled eternally…” [Al-Humaza 104: 1-9]. An interesting feature of Allah’s way of distribution of Rizq is that while He appoints you as an agent for distributing the share of other persons’ Rizq from your wealth He also compensates you equally for whatever you give away. “Indeed, my Lord extends provision for whom He wills of His servants and restricts it for him. But whatever thing you spend in His cause – He will compensate it; and He is the best of providers.” [Surah Saba 34:39]. If you understand that Allah Subhanuhu Wa Ta’ala has given you a large basket of Rizq because the Rizq of other people who are dependent on you is included in it, then Alhamdulillah you are on the right track. So value your close relations and try to help humanity as far as your means permit. Only Allah knows whose Rizq is added to your basket and is meant to be given away and not kept unspent. When that Rizq is gone your basket will contain only your share and will be obviously lighter than before. However, exercise moderation in charity and neither hold your hand completely nor extend it so much that you spend everything and become a destitute yourself. May Allah increase our Rizq in a way that it becomes a source of our investment for the hereafter by spending it on those who may be our partners in Rizq and by looking after the poor, the needy and the less fortunate. A well-thought, broad canvass, essay. JazakAllah. In relation to “The secular view of Rizq is concerned more with the production, distribution …”, my thought is even these aspects are part and parcel of Islamic theology/ religion as clearly evidenced by the advice of Prophet Yusuf (Joseph) and so beautifully captured in Surah Yusuf (Surah 12). (As a side note, ‘secuIar’ functions, i.e., governance et al, are inseparable from religion as was demonstrated by the establishment of the first ‘Islamic’ state by Prophet Muhammad SAW even as he continued to receive revelations and continued deliverance of other aspects of his Prophetic mission). I am unsure to what extent the definition of Rizq could be extended in contemporary times and lifestyles. If we take Rizq at par with sustenance, one could possibly argue that Rizq means all those resources which are necessary to sustain living (not extravagance). At one place in Quran, it is mentioned that (approx translation) ‘For, if Allah were to grant abundant sustenance to His servants, they would behave in earth with wanton insolence… (42:27)’. This balance goes hand in hand with the core premise that one’s effort must be for the hereafter and not, unnecessarily…willy nilly…acquire the wealth and be consumed with the desire . Lastly, Rizq is something which Allah has taken upon Himself to provide for, for all His creation. As narrated in one saying of Prophet Muhammad SAW, ‘ If you put your faith completely in Allah SWT, He will arrange for your sustenance in the same way as He provides for the birds They go out in the morning with their empty stomachs and return filled in the evening (approx translation)’. Many thanks for asking. Please go ahead and forward. Cheers. Dear Syed. I deeply appreciate your supplementary comments. These are indeed valid and should be read as a continuation of the blog. Stay blessed.